I can say that this ice cream cake recipe is a classic example for serendipity. I think you can guess where I’m going if you’ve read my choconut muffins story. To cut the long story short, my first batch of muffins did not come out well. The bottoms were moist but the tops were dry. I wanted to bake another batch of those delicious chocolate muffins, but didn’t know what to do with the first batch, then an idea flashed in my head. Why not turn it into an ice cream layered cake? See, watching Food TV does help, especially Sandra Lee’s Semi-Homemade Cooking. I’m a big fan of her innovative ideas. Now back to the ice cream cake recipe, I won’t say this recipe is my discovery, but come on guys, I need some credit here for thinking quickly and not wasting food. Right? I’ve seen Oreos Cookie Pie crust in stores, so that was also an inspiration. I’ve always wanted to buy it and make something. My idea was similar to that. I wanted to crush the muffins, both tops and bottoms in a food processor, put it in a pie tin and layer with ice cream and freeze it. I had vanilla ice cream at home. I wanted a Neapolitan Ice Cream look so thought of going with strawberry and chocolate flavors. Then realized that my mother in law is not a big fan of strawberry and she likes pistachios. Unlike India we don’t get pistachio flavored ice cream here. I thought why not go with instant pudding mix. I’ve seen it being used by Food TV chefs all the time. So thought of giving it a try. 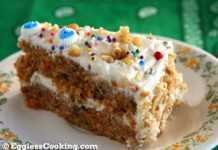 The beauty of this cake is there is no set of baking procedure or must have ingredients. You can play with your imagination. Anyway I’ll list what I used and what other variations can be made. 2. 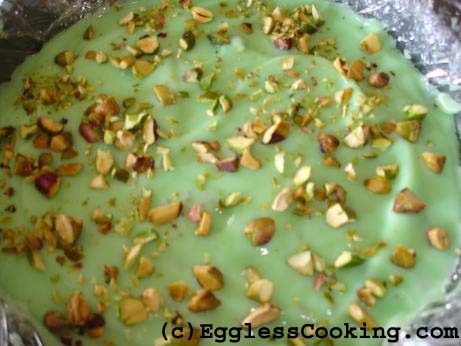 1 packet JELLO Instant Pudding Mix, pistachio flavor. 3. Turkey Hill Vanilla Bean Ice Cream. 4. Walnuts and Pistachios, unsalted and chopped. 1. 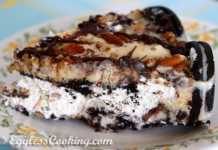 Crush Oreos cookies or brownies, or line the pan with frozen pound cake, or use ready made pie crust. 2. You can either go with all pudding mixes with different flavors or cool whip or all ice cream layers or mix and match. 3. Toppings are also limitless, from fudge sundae, caramel topping etc. Crush the muffins in a food processor. I used a 9 inch round cake pan. First I thought of using a pie tin, then I changed my mind. 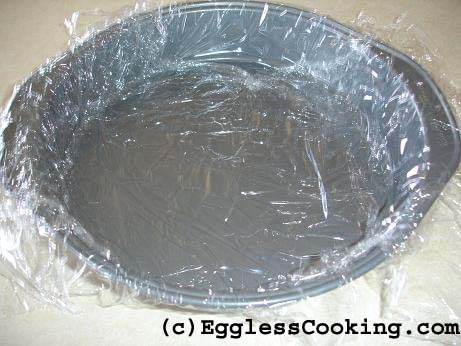 I lined the pan with plastic wrap because I vaguely remembered something similar to this in one episode of Food TV. I wrapped it completely covering the entire pan and also left some extra outside so that I can lift the cake with the wrap once it freezes. I pressed half the quantity of muffin crumbs on the bottom of the pan, nice and firm. Actually I had stored the muffins in the refrigerator to dry them up so it will powder easily in a food processor. If I had left the moist bottoms out,it would have become one big lump I guess. Reserved the other half for another layer. Prepared the pudding as per the directions of the package. It was very easy. Just pour the mix in milk and stir. Initially it’s in a liquid form and within 5 minutes it firms up. I also mixed some chopped pistachios to the pudding. 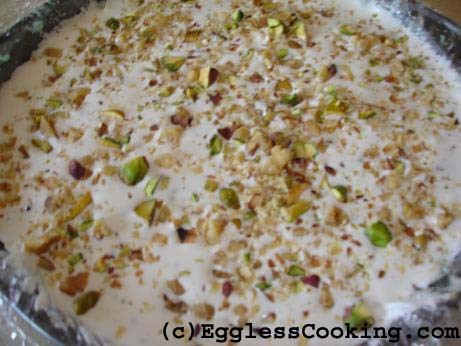 Now top the crumbs with the pudding and form a nice thick layer and top it with pistachios again. Top the pudding layer with the remaining muffin crumbs. Now a layer of vanilla ice cream over the muffin crumbs. I microwaved the ice cream with the paper container for 15-25 seconds, so I could spread it. Give the final touch of adding some more walnuts and pistachios. Freezing for 4 hours should be fine. Carefully remove the cake with the help of the plastic wrap. When I took it out after 4 hours it was good, but another 1 or 2 hours should be perfect. Slice and serve it! 1. You can also try this with a loaf pan. 2. I noticed that when pudding freezes it’s very hard than the ice cream. If you don’t like that to happen you can make all ice cream layers or dig in after thawing it for a couple of minutes. 3. The taste was out of the world. I miss Indian Cassata ice cream very much. 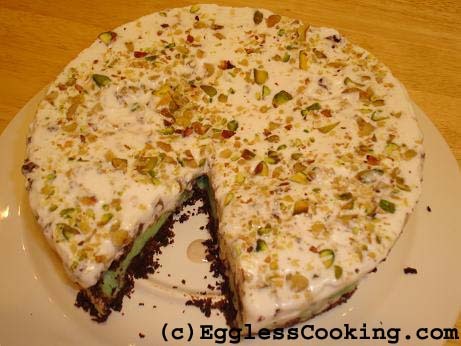 The taste of this ice cream cake was very much similar to that, I think it was because of the pistachios and walnuts. You could use ice cream itself. 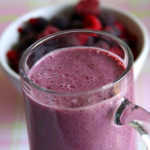 Wonderful recipe!1Can’t wait to try it out! !I have a doubt regarding using oreo cookies..i i use them what about the cream in it?Is that okay? 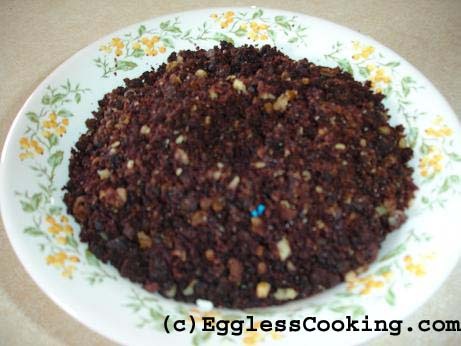 Anshita, readymade oreo cookie crust is available. You could use that itself. Or try crumbling 1 or 2 cookies with the cream and see how it comes out. I think that the cream should help to form a nice shape and keep the crumbs together on the pie plate. 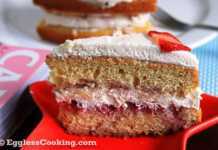 I have made this cake twice.. Once with butterscotch pudding and ice cream and the second time with cool whip and ice cream for the layers.. As you mentioned, in the pudding version , the pudding hardens more than the ice cream and when you thaw it , the top layer ice cream starts melting fast but the pudding still remains hard.. So the next time i tried cool whip for the inner layer and then ice cream on the top, it was great.. We like this one better.. Thanks for all your wonderful recipes.. They are all out of the world. Yojana, that’s a wonderful idea of using Cool Whip. I too am going to try it the next time. This is just a friendly note from a big fan of your blog. Thank you for the wonderful recipes. Thank you very much for your concern Priya. As far as I know the Jell-O jelly crystals alone have gelatin and not the pudding mix. For the ice cream cake I have used the pudding mix only. Please feel free to let me know if my understanding is incorrect. 1. Can I use my date and walnut cake instead of muffin crumbs. 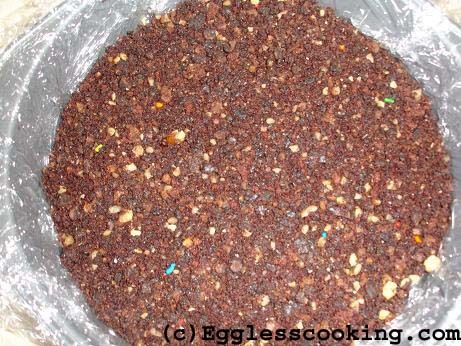 If yes, do i need to freeze the cake first so get the crumbs (dry/powdery) consistency? I have stored my cake in the refrigerator in plastic container right now. 2. Do you think i can use chocolate chip ice cream instead of vanilla as I have a big bucket of chocolate chip ice cream lying in my freezer for a long time now? Hi Yojana, you can use any cake/ice cream combination. If you have cut the cake into pieces and its moist you can simply line the pan with the pieces without any gaps and start layering the ice cream. If you have not cut it and the cake is very moist I would suggest freezing it for an hour or so and then use a processor to get crumbs. I got Readymade Graham Cracke crumbs. can i use those to form the bottom lining instead of muffin or oreo crumbs ? Do I have to follow any special directions if use them like bake or freeze them separately ? For this cake can we try with a ceramic ware instead of the metal bake ware ? Deepa, check if the ceramic is freezer safe. Awesome idea. I love frozen desserts and this one looks perfect. A must try! 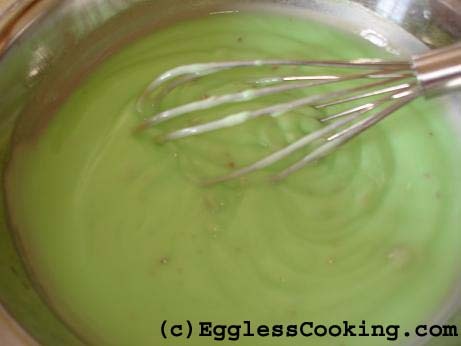 The jello pudding mix does not have gelatin right? just to make sure. u have a wonderful site which is so readable. keep it up. Thanks Sai. The pudding mix doesn’t contain gelatin, I’ve checked it before. For this cake, I didn’t use a food processor. I crumbled the muffins in my Magic Bullet Blender. Recently I purchased Kitchen Aid’s 7 cup food processor, yet to use it though. I’m gonna try it very soon, got cucumber from the grocery store this time. 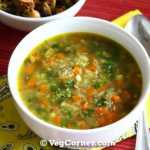 Hi Madhuram, thanks for stopping by my blog 🙂 Tellevu is a form of soft thin dosas and is used in the Havyaka language…its a dialect of Kannada ! 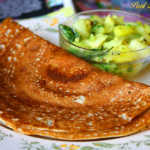 Do try the dosas and let me know how you like them ! 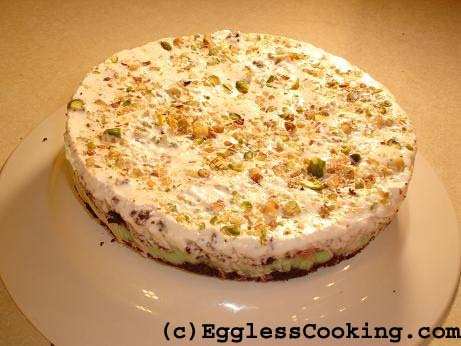 Your eggless ice cream cake looks yummy..Will definitely make it ! Sure Nags. 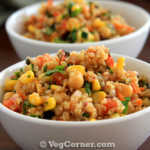 Here is the URL (http://connect.sailusfood.com/) to subscribe to their RSS aggregator. Thanks for subscribing to my RSS feed. Just wanted to ask, what is TOI RSS what you had mentioned there? Could you help me out with that too, please?